The stock alarm app is enough for most people. But if you want more sophisticated enhancements over the stock app, try Timely Alarm Clock app for Android. It has some nice features that puts it a cut above the competition in Google Play Store. You can get Timely app for free. Timely Alarm Clock app also comes in a Pro version ($2.49) that provides cloud sync, additional themes and clock designs and more. Timely Alarm Clock app for Android is an attractive alarm clock app. It looks much like the stock app, but with a slightly animated background. The stock theme includes bubbles that float around in the background. You can change the theme anytime as you wish. Changing the theme involves picking a new background animation as well. The available color palettes are robust. You can also change the clock appearance between digital face, traditional timepiece and a concept design. The default screen has the standard clock centrally oriented. Swipe left to right will bring you the alarm function. Swiping from right to left will bring you the timer/stopwatch feature. The app is pretty easy to use. 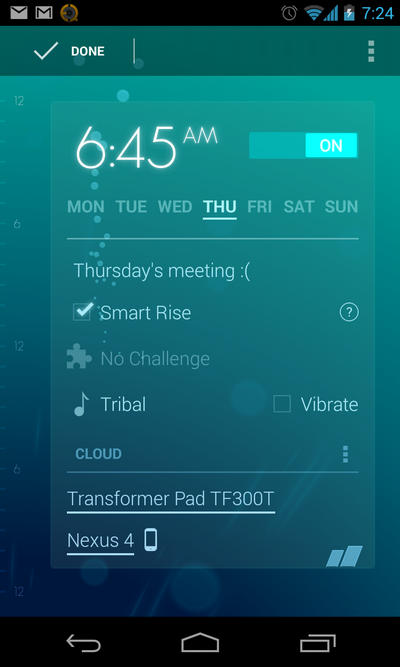 To set an alarm, swipe to left to right on the concerned screen and slide a banner to the required time. To set a timer, you simply slide your finger in a circle around the clock until you reach the desired time you want. Tapping on the screen starts the stopwatch. Being a free app, Timely Alarm Clock is ad-supported. But for the first five days, you can use it ad-free. Afterwards, you have to shell out $0.99 to get rid of the ads. For cloud sync support, you got to pay $2.49. You can also purchase sound pack, theme pack, custom theme support, and clock faces separately if you wish so. Timely Alarm Clock app for Android also includes widget support, compatibility with DashClock extension, and has an option that let you snooze alarms using the physical volume buttons. The app uses 38 MB RAM while running. Timely Alarm Clock app for Android is a beautiful alarm clock app notable for its eye catchy animations and customization options. Of course, it is quite functional with a working timer, stopwatch, and alarm clock. It is pretty easy to set up the app’s various functions. Cloud sync is available only with the pro-version. Verdict: If you’re looking for an alarm app with more features than the stock one, check this out.